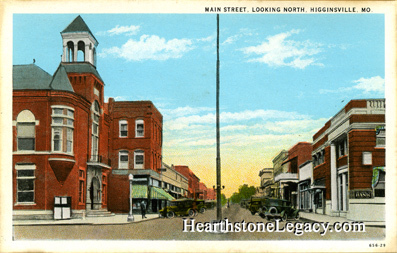 This postcard view pictures Main Street as an unpaved road from the intersection of 20th and Main Street and looking north. The old City Hall building is at the left and the Farmers Bank building is at right.. A flag pole sits in the middle of the street intersection. Published by Huscher & Koppenbrink. Printed by C. T. American Art Colored. The postcard was not postmarked but dates from the 1930's.